Uregare was once a parish in its own right, although it now forms part of Bruff. There were two churches here according to Westropp, Uregare and Urigedy chapel. Uregare church was removed to build the graveyard wall between 1826 and 1840. The site of Urigedy was reputed to be situated to the east of the graveyard. The church ruin in Glenogra is still in good condition. This church was dedicated to St Nicholas on December 10th 1410. 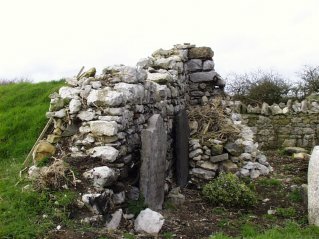 The ruin is situated in Glenogra graveyard, and Westropp states that it had tombs of de Lacys, Roches, Bourkes, O'Gradys and Fitzgeralds. Tullabracky was also a parish in its own right before becoming part of the parish of Bruff-Meanus-Grange. Tullabracky church ruin was almost levelled by 1901. One wall of the church ruin now stands in Tullabracky graveyard. According to Westropp, the church in Bruff was dedicated to St Peter of Alexandria on the 26th November 1410. It had fallen into decay and so was demolished by Lady Lucy Hartstonge and a new church built on its site in 1776. The present day Church of Ireland church in Bruff is dedicated to St Peter of Alexandria. According to Pat Quilty, it is believed that the Penal Church stood between Crawfords Lane and Chapel Lane. However, he himself has not seen any printed reference to said church, although Bruff Parish Records seem to go back to 1777. Westropp also lists a church in Ballygrennane. This church was in the old parish of Uregare. It is said to have been built by George Evans after 1690.